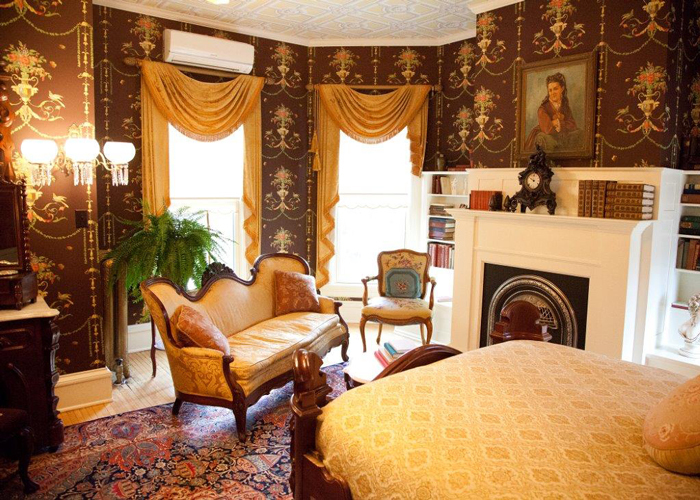 This suite is a fitting tribute to the love story of Elizabeth Barrett Browning and Robert Browning, two of the most celebrated poets of the Victorian era. Large windows give guests tranquil garden views below, while rich chocolate-brown wallpaper featuring colorful urns, birds and flora set the perfect backdrop for a spectacular Rococo Revival half-tester walnut bed. An opulently carved marble-topped boudoir table is the throne of femininity while bookcases flanking the fireplace lend an air of literary elegance. A beautiful stained glass window adds serenity to the bath featuring a deep rectangular tub and a luxurious shower.